Along the former border between East and West Berlin, close to the heart of the city, you’ll find many examples of great contemporary architecture. While studying in Germany, we had a studio trip to Berlin with one of our professors. He took us on a tour which, until today, I take my own guests when they are visiting Berlin for the first time. It is a mix of impressive contemporary architecture, landscape architecture, urban art installations, and the occasional touristic spot. On a warm day, it is a super nice stroll. The suggested route starts at Berlin's Central Station (Berlin Hauptbahnhof), easily reachable via S-Bahn and U-Bahn from anywhere in Berlin. The station building was completed in time for the 2006 World Cup and is one of the largest train stations in Europe. It is composed of two crossing railway levels. Ten meters above street level and partially covered by a tube-like roof are the east-west tracks. That's where the S-Bahn rolls along with long distance trains. The north-south tracks are located 15 meters below ground. Completing the volume of the station are four office towers, connected above the concourse's roof by two bridges. Most striking are the views up and down all these spaces while walking through the station or standing on one of its many bridges. All the way up on the upper tracks you can spot the trains on the lower levels arriving and vice versa. 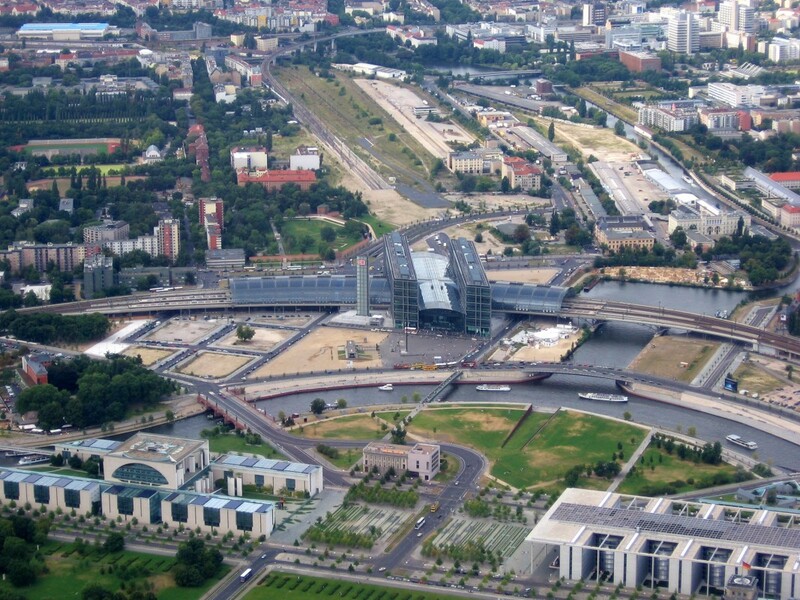 North and south of the Hauptbahnhof is a new urban development region called Europacity . It extends for over 40 hectares of land intended for new mixed-used development and is one the prime real estate locations currently under development in the city. It all started with the Central Station, and now the area is partially a big construction site. In the meantime, some interesting buildings came up which are worth a look. 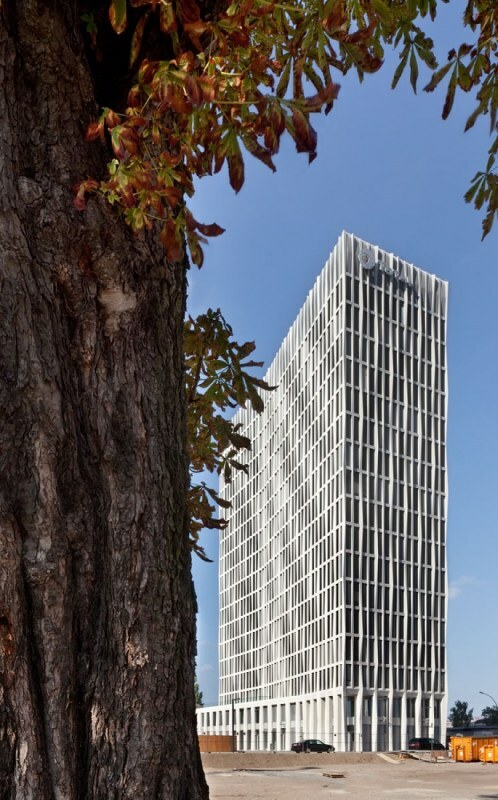 It's first and tallest building is Barkow Leibinger's Tour Total, completed in 2012. It is characterized by its load-bearing facade composed of origami-like folded elements. It gives the tower a peculiar and dynamic appearance during different light conditions and different viewpoints. 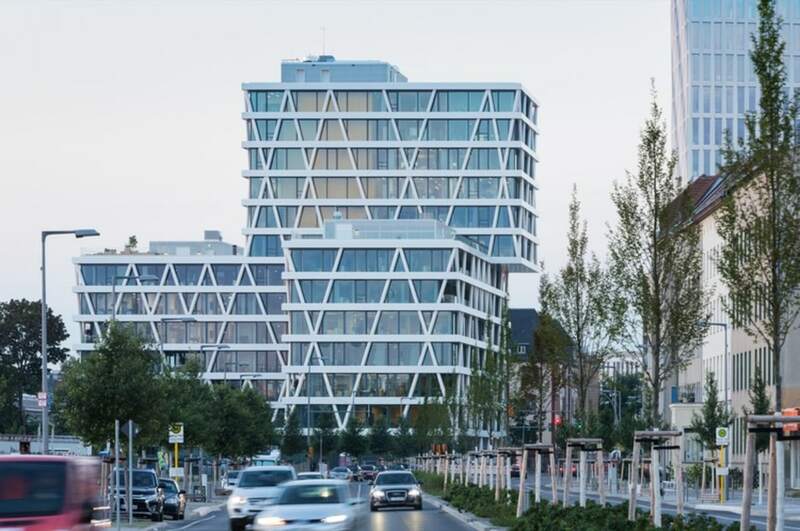 Right next to Tour Total you can spot one of Europacity's newest members, the 50Hertz Headquarters by LOVE Urbanism. Its diagrid structure displayed on the facade is its most striking element. At first sight a regular diagrid, it has members removed here and there, adding an extra movement to the tower's simple but bold volumetry. 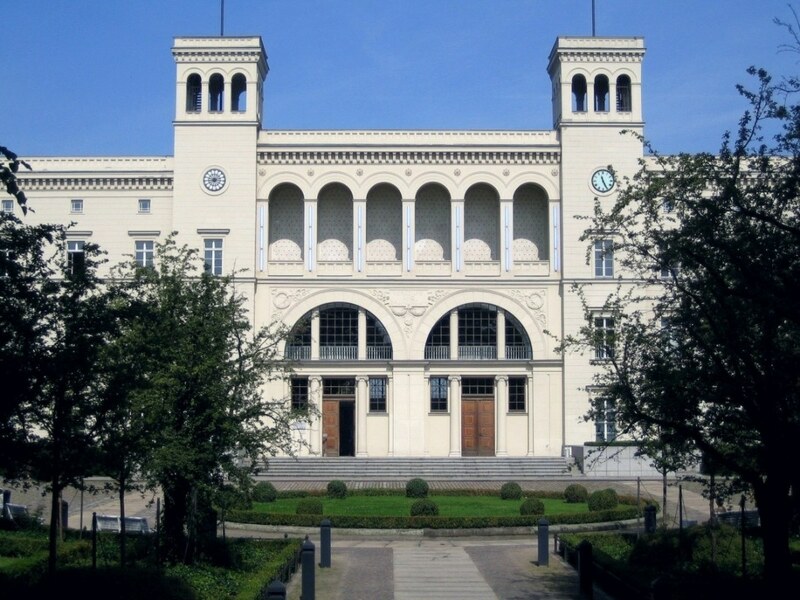 Right next to Europacity is one of my favorite contemporary art museums in Berlin: the Hamburger Bahnhof. One of the oldest station buildings in Germany, it was deactivated back in 1884. During the 90's, Kleihues+Kleihues guided the renovation and conversion of the station into the current Museum of Contemporary Art. It is not only a great building but also a fantastic museum with an excellent permanent collection and exciting temporary exhibitions. Head to the Central Station's south side. 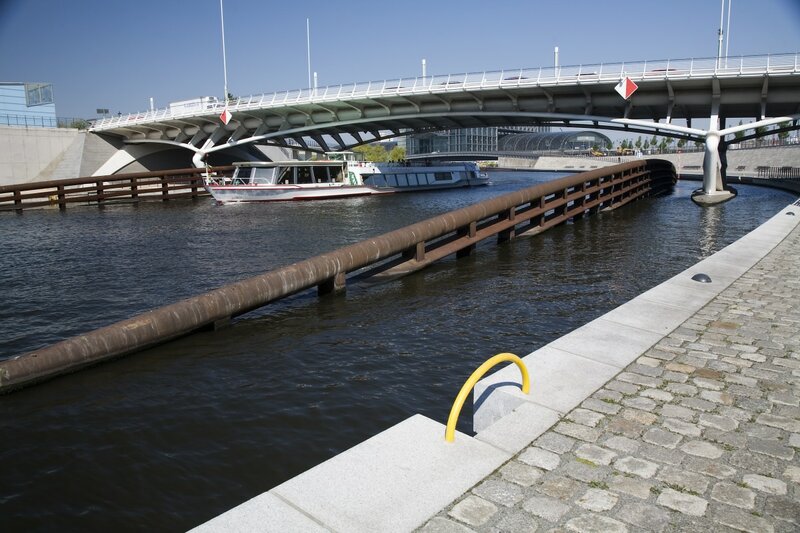 You'll reach the river Spree in an area called Spreebogen (literally the "Arc of the Spree" due to a curve at the river Spree in the area). You can cross the river via a small pedestrian bridge. As you pass it, take a peek at Sauerbruch Hutton's iconic extension to the Fire and Police Station over to the west. 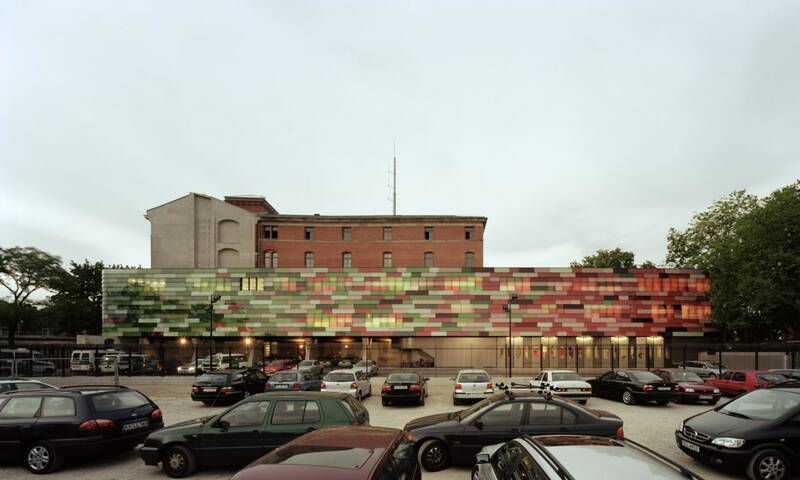 The architects created an extension to an existing 19th-century structure, covered with colored glass shingles in a gradient color pattern. It goes from red to green, symbolizing both the colors of the police and the fire brigade as well as making reference to the existing brick building and its green park surroundings. 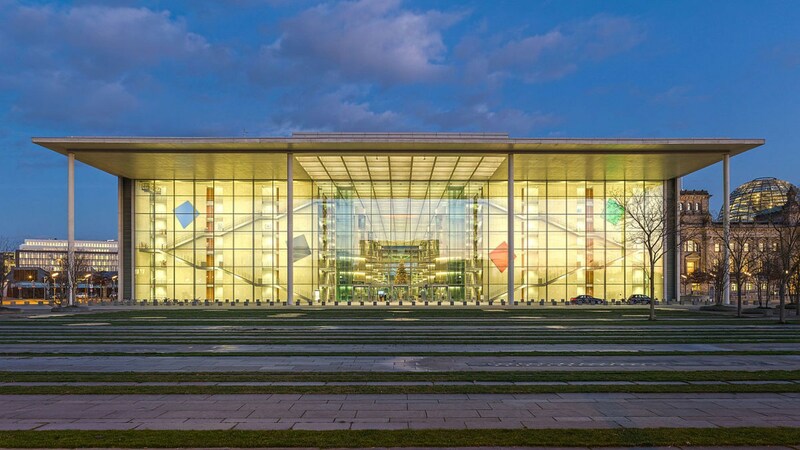 It is one of the first iconic buildings of the German architects employing the use of colored glass panels, which became a trademark of their work. After crossing to the south shore of the Spree you'll be standing on the Spreebogenpark. This is one of my favorite examples of landscape architecture in Berlin. Designed by landscape architect Toni Weber, it is a triangular-shaped park composed of large open lawns and smaller, more intimate gardens with seasonal plantings. As you reach the park, head to one of these gardens to the right, which will lead you down to the river promenade. Notice the texture on its concrete walls, the varied plantings, and, most interesting, the sculpture at its end: it is as if a whole piece of the containment wall was "plugged out "to open a passage to the river side. Here you can see another surface treatment used in the park walls: corten steel. On the riverside, the concrete is much more polished creating a strong contrast with both the corten as well as with the textures in the inner concrete walls. Are you walk along the promenade (which, in Summer, is full of seating areas and pop-up bars), you'll reach another feature of the part: a straight cut on the landscape, named by the architect a "landscape window." It opens the view to the future Humboldthafen in the north and to the Tiergarten and the Potsdamer Platz further south (from here you can easily spot the roof of the Sony Center from Helmut Jahn). As you continue east along the promenade, you'll eventually cross a bridge with an uncanny style: the Crown Prince Bridge, by Santiago Calatrava. Complete in 1996, it is a strong symbol of the German unity, as it replaces the original bridge demolished in 1972 to prevent refugees from crossing from East to West Berlin. It might not be one of the most striking works from Calatrava, but his signature structural style is there. Past the bridge, you'll reach the Band des Bundes , or Federation Ribbon. 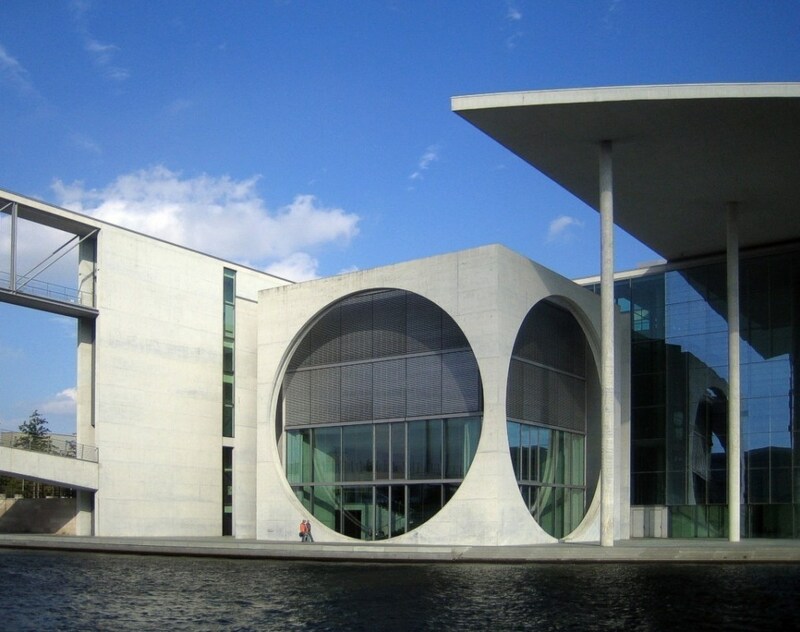 After the parliament voted to move the central government from Bonn to Berlin in 1991, a process started to choose a design that could represent the unification of Germany and house its government. The resulting master plan from Berliner architects Axel Schultes and Charlotte Frank is composed of three buildings. 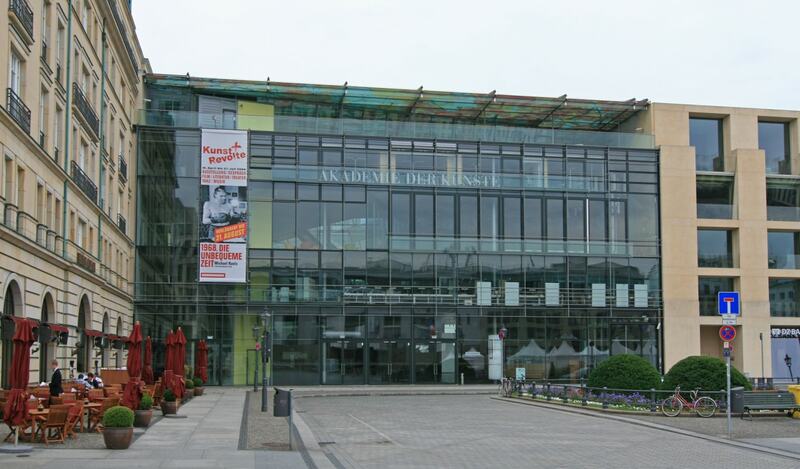 The Kanzleramt Building, located further to the east, was designed by the same architects. 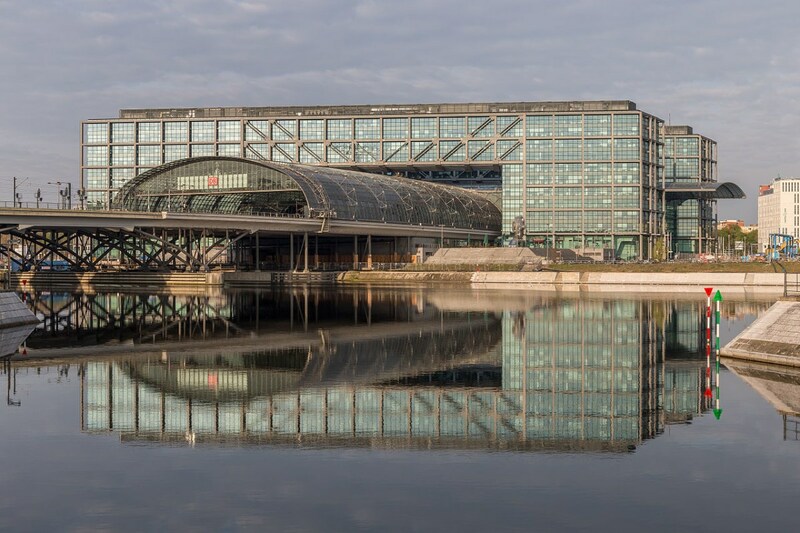 The two other buildings, Paul-Löbe-Haus and Marie-Elisabeth-Lüders-Haus, between which you'll find yourself, are located on opposite sides of the River Spree and connected by a thin bridge. Both were designed by German architect Stephan Braunfels. On the east side, the massive facade of the Paul-Löbe-Haus offers you a chance to peek across the building and see the Kanzleramt at the opposite end of the Ribbon. Note the art installations along the sides of the building and also at each of its ends. My favorite is Neo Rauch's "Man on the Ladder ", a light installation which plays with reflections representing the iconic images of people from East and West Berlin waving to each other across the Wall. Across the Spree, on the West side, you can see the Marie-Elisabeth-Lüders-Haus, which houses the Parliamentary Library. Inside you can spot a publicly accessible memorial containing original segments of the Berlin Wall and commemorative crosses to the people who died trying to cross it. Note the roof line of both buildings: from the top, their curvature match perfectly as if they were both detached from one another. If you haven't seen anything about the Berlin Wall yet, keep an eye on the floor right next to the Paul-Löbe-Haus. You'll see, marked on the floor, the line of the wall running north-south. The Wall line is marked throughout Berlin, and you can follow it through its more the 140 km length, going around the occasional building built on top of it. Perhaps the most famous and definitely one of the most important buildings in Berlin, the Reichstag stands mighty next to the Federation Ribbon. Witness to many key moments in German history, the building was both destroyed and renovated before Norman Foster's intervention in the 90s. Foster's project gutted the building keeping only its outer walls, as well as some traces of historical importance (including graffiti left by Soviet soldiers after the final battle for Berlin in 1945), before starting construction of its new, modern interior. The glass cupola which did not exist in the original competition scheme won by Foster in 1992, is the most striking feature of the building. In its interior, the visitors can rise up to its apex via a double-helix ramp, around a conical mirror structure which brings light to the plenary room below. From the top, other iconic buildings such as the Brandenburg Gate, the Alexanderplatz TV Tower, the Sony Center and the full expanse of the Tiergarten Park are visible. In the past, you could just come up to the door and get in to visit the cupola. Nowadays, security measures are more strict, and you have to make a reservation in advance . Continue south towards the most famous touristic attraction of Berlin: the Brandenburger Gate. 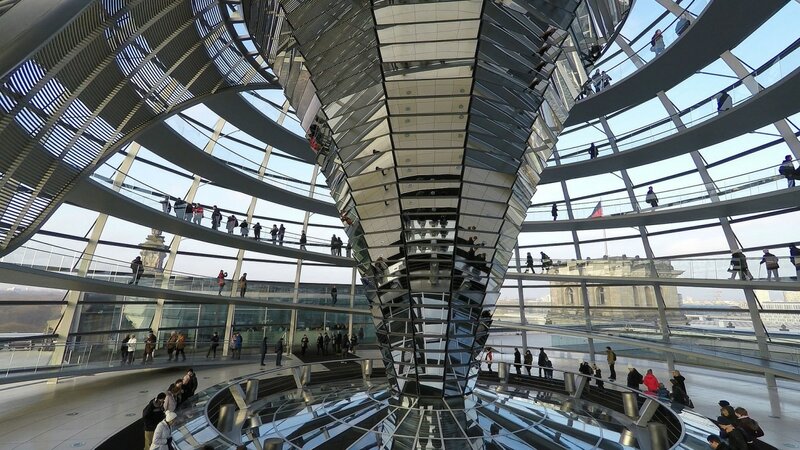 After checking it out, pass through it to reach the Pariser Platz. The Pariser Platz is the home of some interesting contemporary buildings. On the north, Christian de Portzamparc's French Embassy has a beautiful inner garden behind its bland facade, unfortunately inaccessible. Ignore that and turn south (also ignoring Moore Ruble Yudell's American Embassy, with that eyesore of a canopy!) looking out for Frank Gehry's DZ Bank in the center, followed by Behnisch & Partner's Academy of the Arts (Akademie der Künste). 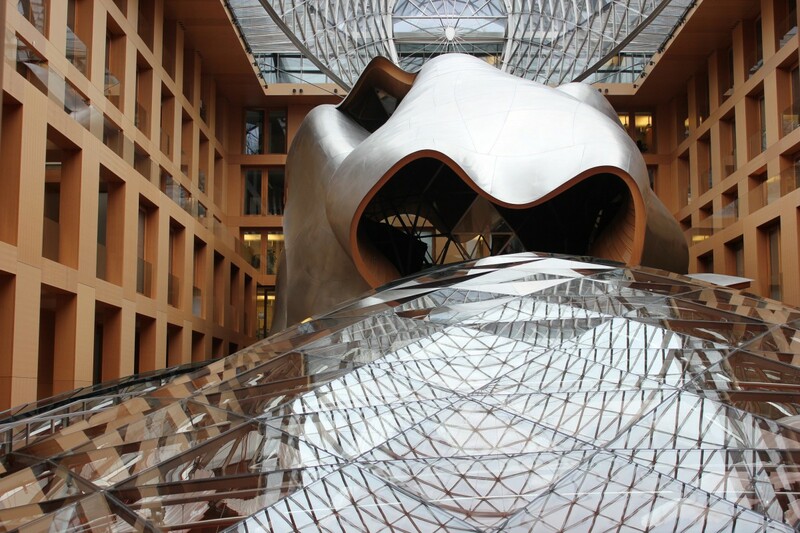 The DZ Bank building, by Frank Gehry, is a building with three identities. The Pariser Platz facade follows much of the urban planning regulations, with its regular window configuration and the recessed top floors. Once you enter it, it's apparent conformity gives way to a spectacular atrium containing an intricate glass roof and an irregular large metal structure housing a conference room, which sits on an undulating glass floor. The atrium is lined with more of the regular opening pattern of the first facade while, through the glass floor, a banquet hall on a red carpet occupies the building's basement. While these two parts house the bank's main offices, the building crosses over the site to the opposite street, where it reveals its third identity: an undulating facade with protruding windows housing 39 apartments on a fashion that became characteristic from Gehry since his early buildings in Prague and Düsseldorf. But to see this facade, first head to the next building on the list, the Academy of the Arts. The current building of the Academy of the Arts replaces its former seat from 1902. It represents a new period in the history of the Academy which was divided for many years between East and West Berlin, unified after the fall of the Wall. It houses the main offices of the Academy, while its activities extend to another building in Hanseatenweg. Designed by German architect Peter Behnisch, the Academy of the Arts building on Pariser Platz occupies a narrow and long site (36 m wide and 80 m long). Its facade stands out for being the only one in the plaza entirely transparent, extending the public square to its interior. Inside you’ll find a large open space crisscrossed by glass staircases and roofs and lots of light. There are regular exhibitions in its main room and the cafe offers a good spot to have an espresso and cake before heading on to our next stop. Now go through the cafe toward the back of the building. On your way out, check Reinhold Begas Prometheus sculpture which was hidden in the wall to protect it during the War era. 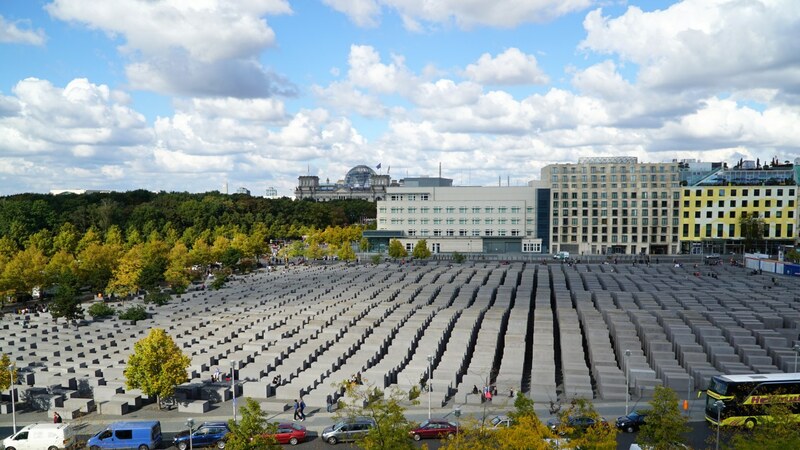 Then head out to one of the most striking monuments in Berlin: Peter Eisenman’s Memorial to the Murdered Jews of Europe. Also known as the Holocaust Memorial, it is a vast monument composed of 2711 concrete slabs placed in a grid pattern over a sloping field. They vary from 20 centimeters to 4.7 meters in height. The experience is hard to describe. There are no inscriptions, no details, only concrete and pavement. It strips itself of all meaning to allow each person to apply its own interpretation to it according to their own feelings while walking around the memorial. The design was chosen from over 500 entries in two competitions. In the first competition, entries which had the names of victims or the concentration camps written all over it were later rejected. In the end, the choice was for something that did not directly tells the visitor what to feel and what it means, but one in which this happens naturally in an intimate way. Make sure to check the Place of Information, a small, four-room information center about the Holocaust, located underground on the monument’s east side. 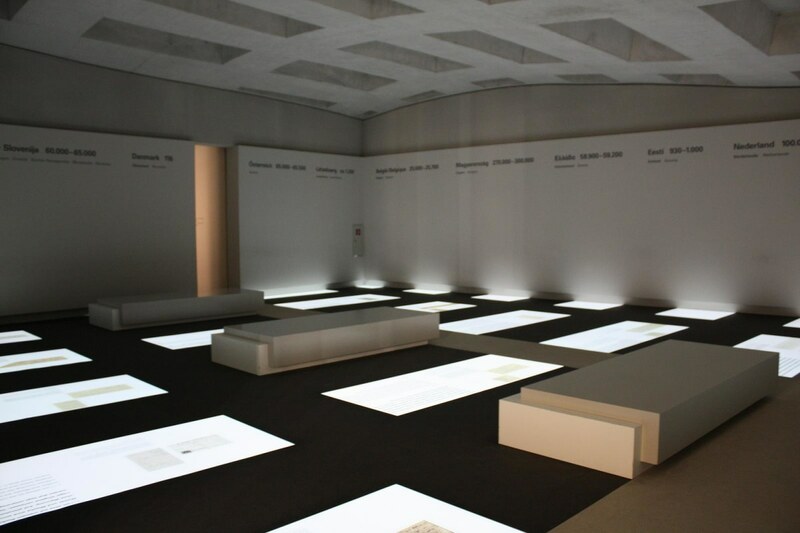 It is one of the most impressive and concise exhibitions of the atrocities of the Holocaust. © Daniel da Rocha 2019. Made with VuePress.